An easy to grow terrestrial orchid known for its striking foliage. 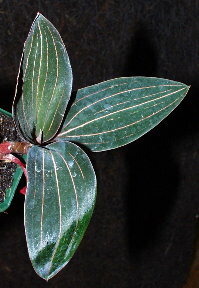 Bright salmon colored veins contrast with dark green, almost black leaves. Likes high humidity and moist conditions. Spikes of white flowers in winter. 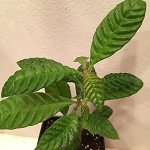 These are plants 3"-6" tall established in 3"pots.